It’s February 16th and the record breaking snow and frigid temperatures continue in Boston. I took this picture (on my cheap camera phone, sorry) as the 3 yr old and I sat in the car waiting to pick up his big sister from school. 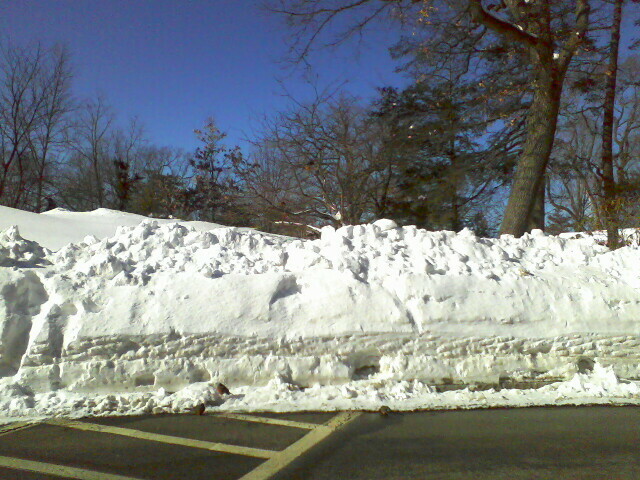 You can’t really see unless you make it bigger (ctrl +) but there are eleven robins in that little tree above the snow bank, and three right at the bottom of the snow bank. There were berries in the tree and on the ground that they were nibbling on. But the wind was biting, and they were all puffed up to more than twice their usual size. When the wind blew they would turn towards it so it blew with the grain of their feathers; when the wind caught them facing the wrong direction it pushed their feathers out painfully and blew them across the snow till they reoriented themselves. It was a strange and pathetic sight, and both sad and ironic to me to see those little emblems of spring struggling moment to moment through this harsh winter. That evening I left the kids with their parents and tramped down to take the subway then a bus home. I usually drive to that job, but there were no parking spaces on their narrow, one way street that weren’t being desperately saved by the residents. The previous week I’d taken the T (short for Massachusetts Bay Transit Authority, for those who aren’t from around here) to their house and they’d called an Uber for me to get home, but this week, when they asked me to come in earlier because the 3 yr old was home, sick, from school, I offered to reverse it and have them Uber me there so I could get there sooner. But that meant that I had to wait for the train and bus outside, after dark, on one of the coldest nights of the year. I made the first leg okay, but then I stood outside waiting for the 51 bus for 45 minutes, and it never came. Three should have come during that time, according to the schedule, but the T, like most of the rest of us Bostonians, isn’t dealing that well with all the snow. When I couldn’t feel my face or toes anymore I limped the two blocks to Harvest Market and warmed up for a few minutes, then went out to wait for another bus which came more often but didn’t take me as close to home. Ten more minutes in the freezing cold and the bus finally came. I climbed on but couldn’t even get past the yellow line because of the crowd. This bus would take me a mile in the right direction, and then I’d have to walk the rest of the way. At the next stop I had to quickly step back into the cold to make room for the people getting out. An elderly woman with a small child got on. And I thought, as I have often this winter, of the people who have it so much worse than I do. I’ve had a couple of snow days, when my employers didn’t have work so I didn’t either, but I got paid for them. Most hourly workers don’t, and have missed work through no fault of their own, and will have to pay just as many bills this month, but with a smaller paycheck. I’ve also been able to drive to work, most days — my other employers have a driveway I can use. But many Bostonians, even those with money, have no choice but to use the T, and delays have been severe. It took me two hours to get home that night — a 3.5 mile drive. Many people have had two hour commutes both ways for days. And some people have to get their kids to daycare by public transportation, get themselves to work, and then repeat the process on the way home. I looked at the woman and child on the bus and I thought again how the knowledge that some people have it a lot worse than I do wasn’t helpful to me. “It could be a lot worse,” the thought meant to cheer me up, to make me grateful for what I have, instead makes me despair even more. Now I feel the weight not only of my own trials and suffering, but of numberless others as well. And I wish even more that I were stronger, more well off, so that I had extra energy and money to actually help some of those others. I limp along (literally now, since I pulled a muscle yesterday shoveling), getting my own stuff done, shoveling my own sidewalk and car, and making it to my own jobs. It’s been hard, and I feel overwhelmed, but I am doing okay so far. But how I would love to be able to do more than okay, and to offer a hand to others as well: To dig an elderly neighbor out of the snow, to offer rides to some of those struggling to get to and from work. Last Monday my two housemates were both away for the storm, and I struggled out that evening to clear a path through our driveway to my car. I was feeling really badly — anxious and depressed and tired — and I didn’t know if I could do what needed to be done. But when I started shoveling I realized that there was something other than the snow weighing on me. I’d been reading The Irrational Season by Madeleine L’Engle, and it was much more of a devotional book than the autobiography I’d expected it to me. The first few chapters were her thoughts about God, in essays and poems. And it was hard for me to read, for the same reason the Bible is hard for me to read lately: Those thoughts, words, and emotions that used to mean so much to me, that used to lift my heart and my spirit, now were empty. And the deep meaning they used to have for me was like a mockery of the emptiness I now felt. John of the Cross called this the Dark Night of the Soul, and it is something that I have struggled with for several years now. 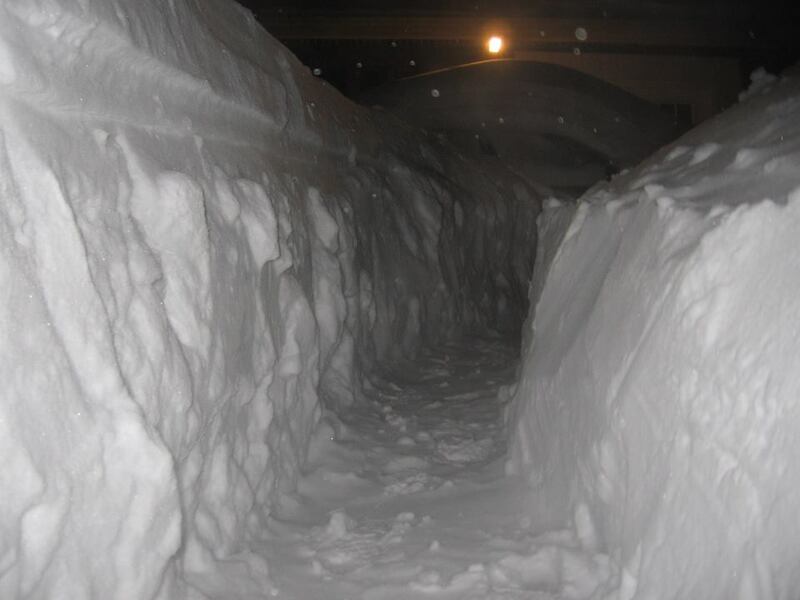 This is the path I was shoveling through our driveway. So I’d been reading The Irrational Season while the snow fell and the afternoon deepened into evening, and then I went out to shovel while there was still some daylight left. And as I began to plow my way through the drifts, almost weeping with how much had to be done, I prayed. I didn’t pray about the snow and the shoveling. I called out to Jesus and begged, again, for him to be in my life and my heart; for him to be the center and purpose of my life, as he once had been. Just saying the prayer made me feel a tiny bit stronger, and I tried to focus on moving each shovelful, on the very small, specific task that lay in front of me: Not the whole driveway but that one shovelful of snow. Each one. And then the next. Still, it was freezing out, and still snowing, and the wind whipped the snow painfully into my cheeks. I made it about 2/3 of the way down the driveway that way, one shovelful at a time, but my shoulder and wrists were really starting to hurt. Then our neighbor James came riding up on a white horse (I may be embellishing that part) and offered to do the rest of the driveway with his snow blower. I can’t describe how grateful I felt. I think I would have been crying except that the muscles in my face were too frozen. James plowed through the rest of the driveway in minutes, and I moved on to my car. After a few minutes of lugging the heavy snow that the plows had wedged against my car James came by again and said, “Let me do that for you.” While he was working on my car I starting in on the sidewalks, and James came along and waved me off and did those, too. Well, I thought. So. I had begun the work by seeking the kingdom, seeking God, and the other thing — help with shoveling — that I had not prayed for and had not expected, that had been given to me as well. Here is the full passage, to which the New International Version gives the bold, encouraging header: Do Not Worry. My heavenly Father knows what I need. He knows the needs of the robins, too, and of the old lady and the child on the bus. And even though the words still sting as much as they heal, I will continue to turn back to them. Even though I thought I found the kingdom, and now feel like it is lost, still, I will continue to seek. This entry was posted in City life, Wrestling the tigers and tagged boston, faith, kingdom of God, sermon on the mount, shoveling, snowpocalypse. Although you are walking through a dark time, you are looking in all the light places. Your words are encouraging to this fellow blizzard-zone dweller. Encouraging and relatable. Great men and women of God go through the “Dark Night of the Soul” and come out with stronger faith than ever. Some of the most humbling times are those in which I want to save others and am forced to first accept help myself. I would much rather be the one giving the help, but that too can come from a place of pride. Receiving takes humility, and for some of us may be a greater sacrifice than giving our most prized possession. Humility is a beautiful place for God to have us. It sounds as if you are doing a beautiful work of just “being” in that place of openness. Thank you for the honesty with which you wrote this. I love that you allow yourself to write in such a way that makes it easy for others, like myself, that struggle with similar issues, to be able to relate and find courage and inspiration in this.